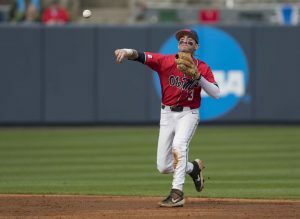 A less-than-stellar weekend ends with a series loss for Ole Miss. Rebels drop Friday pitchers’ duel 2-1 and lose 8-5 on Sunday. But Doug Nikhazy and Parker Caracci delivered a win on the mound on Saturday. The Rebels were never able to combine consistent offense with good pitching, leading to two losses on the weekend. The offense was absent all weekend, grabbing one win thanks to a shutout from the pitching staff. First base: Doug Nikhazy adds stability to weekend rotation. Dropping a series to the Tigers is not what the Rebels were looking to do coming into the weekend. When adding in the performances from starting pitching on Friday and Saturday, losing 2 of 3 to the Tigers stings a bit more. Freshman Doug Nikhazy has replaced Zack Phillips as the second starter in the weekend rotation for head coach Mike Bianco. Phillips’s struggles with his command and ability to put people away lost him his spot in the rotation. Nikhazy’s presence as a starter now means that two-thirds of the rotation is occupied by freshmen. His Saturday outing was just what the doctor ordered. Mizzou was blanked on Saturday, in large part due to Nikhazy’s impressive 7.2 innings of work. The freshman lefty gave up just 2 hits and 2 walks across his outing, but the most impressive number that he produced was hurling 116 pitches. After only seeing action as a midweek starter and a bullpen guy, this performance can establish Nikhazy as a future workhorse at Ole Miss. Second base: Offense goes cold when fine would have been acceptable. This past week’s midweek opponent, Arkansas-Pine Bluff, was in town for two games. Pine Bluff was not offering up the quality of pitching that Ole Miss will face on SEC weekends. Wednesday’s offensive onslaught of 25 runs proved to be a bad omen for the weekend. The offense had to adjust to lower velocity pitching that would only come in a practice session, so adjusting back to SEC-caliber pitching proved to be a challenge. Friday’s loss came after only surrendering 2 runs as a pitching staff. Saturday’s win was not sealed until the end because of the Rebels’ inability to distance themselves from the Tigers. When the pitching slouched on Sunday, the offense just did not have it in them to keep up. The leadoff spot shared by Jacob Adams and Anthony Servideo only produced a single hit all weekend. 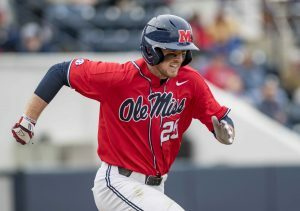 The home-run ball has been prevalent weapon that Ole Miss has been able to rely on this season, but Thomas Dillard’s solo home run on Sunday was the only power the Rebels were able to muster for the series. This team is at its best when the offense is bashing its way to victories. Being able to put together big innings to win games comfortably has been a successful recipe for victories over the past few seasons. This team does not have the pitching staff to carry this team as deep as its postseason aspirations are. The offense has to wake up in SEC play. Third base: Early stumble on the SEC schedule could prove costly. Drawing Alabama and Missouri to open conference play was viewed as favorable. Missing Vanderbilt completely for the season is even better. However, dropping a series in Columbia, Missouri, makes Ole Miss’s situation uncomfortable. A completely different Rebel squad needs to show up over the next two weeks. Next week sees Ole Miss travel to top-10 ranked Arkansas. The following weekend sees top-five ranked Florida come to Oxford. After losing a series they had probably circled as a possible sweep, the Rebels need to find an upset. Losses can pile up in the SEC, and this is the hardest conference in which to try and make up ground.